The introduction of the joint-by-joint theory several years ago initiated a dramatic paradigm shift in the way that I and certainly many other coaches, trainers and therapists view the human body and its movement and training requirements. Although remarkable in its simple complexity, its application woven into the FMS is nothing shy of magic and has become the roadmap for my thought process in my approach to training at Agoge. 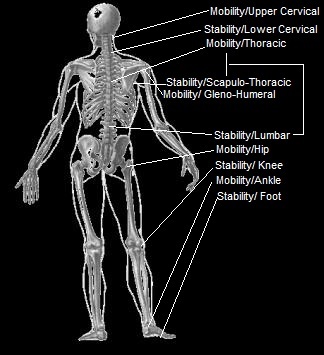 Developed by pioneering Strength and Conditioning coach Mike Boyle and renowned Physical Therapist Gray Cook the joint by joint approach views the body as a stacking of joints, each segment with its own specific function within the choreography of biomechanics, and thus its own specific training rules including specific destructive proclivities should these be abused. Looking at the body from the ground up you will notice what Gray Cook refers to as a pattern of ‘layered opposites.’ Each joint although displaying both mobility and stability, enjoys an emphasis on one or the other and both are necessary. The foot is primarily stable, the ankle is mobile, the knee is stable, the hip is mobile, the lumbo-sacral region is stable, the thoracic region is mobile, the lower cervical region is stable and the upper cervical region is mobile. Doubling back, the scapulo-thoracic region is stable, the gleno-humeral region is mobile and this continues along the chain. Charlie Weingroff expands upon the concept here . We simply could not operate optimally with a string of stacked stiff joints or conversely, a series of mobile junctions without intermittent stability safeguards to control unruly ranges. There must be control (stability) but first there must be an appreciable amount of available movement at a joint or joint system (mobility) for motor learning to occur, and to be able to express that stability. In other words, there must be something to control. The problem occurs when a joint system that is designed primarily for stability experiences excessive motion and when a segment that is designed for excursion is prevented from travel, causing a compensatory switching of roles along the chain thereby incurring dysfunction and potentially, injury. This means that if breakdown does occur, the site of pain is merely the symptom and the primary cause will generally be located in the segment above or below the problematic area. Running, landing, squatting and the like on an immobile or restricted ankle with an inadequate collapse space or buffer zone will collect compensatory collapse or mobility from the knee, transferring stressors to those delicate structures tasked with providing stability. The hips, like the gleno-humeral joint, are multi-axial spheroidal joints capable of great mobility however prolonged sitting which has become all the rage these days has the hips locked into stability; therefore, lumbar spine mobility will be gained at the expense of stability to substitute movement unachievable with fixed hips. With this wretched new lumbar mobility, the thoracic area desirous of mobility, will become stiff and immobile, forcing the scapulae to become unstable and wander the ribcage. From this hunched over flexion everywhere posture, attempts now to raise ones arms overhead will not be met with success as gleno-humeral mobility is now lacking. So it is along the stack, each joint impacting the one previous or following. Lost ankle mobility, begets knee instability, and knee pain. Lost hip mobility, begets lumbar instability, and lumbar pain. Lost thoracic mobility, begets lower cervical instability and gleno-humeral stiffness, or lumbar instability, with the appropriate pain. These are some of the observable defaults. There are of course exceptions and the algorithm is somewhat litigious. It is after all a concept, however sound, not so much law. The facts remain however; we are an arrangement of alternates and in the context of movement, nothing is isolated. Clear first above and below the conflict. Pull the pattern from the particulars. Step back and look around.